Port Blair, May 22: The Lt. 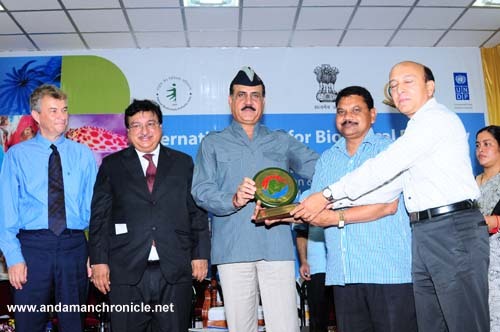 Governor Lt. Gen (Retd) A K Singh today gave away the India Biodiversity Award-2014 at the International Day for Biological Diversity 2014 celebration held at the TGCE Auditorium here today. The 2014 India Biodiversity Awards announced by the Ministry of Environment and Forests, Government of India and UNDP recognizes outstanding models of biodiversity governance. Biodiversity governance models were recognized in four categories i.e. community stewardship, decentralized governance, co-management and protected areas. In the community stewardship category, Van Suraksha Samiti, Baripada, Dhule District, Maharashtra was adjudged as the winners while Mangalajodi Eco-tourism Trust Khurda District, Odisha was the runner-up. Similarly in the Decentralized Governance category, Gram Sabha Payvihir stood winners. Under the co-management category, Old Jalukie Joint Forest management Committee, Peren District Nagaland emerged winners while Whale Shark Conservation Effort, GIR Somnath District, Gujarat was the runner–up. In the protected areas category, Kanha Tiger Reserve, Mandla District, Madhya Pradesh was adjudged winner while Satpura Tiger Reserve, Hoshangabad District, Madhya Pradesh was the runner–up. It was heartening to see that winners and runners–up from these places were present and received the awards from the Lt. Governor.